Most of this website is about gold coins, although we also sell gold bars, and have investment advice and information about gold in general. Gold coins have been produced for about 2,700 years, the first known were issued in Lydia about 640 B.C. We recount a brief history of gold coins on its own page. Coins are a convenient way of using gold as money, although central banks also store much of their gold reserves as gold bars, which are also money. For over 2,000 years most coinage systems used gold for their higher value coins, usually along with silver and copper coins also, as gold is too valuable to be useful for low denomination coins. Because many gold coins are available at very close to their underlying intrinsic gold value, they are a very convenient and sensible way to invest in gold. In our opinion, gold coins are the best way to invest in physical gold. Because gold is a valuable metal, and because of its other desirable properties, gold is an obvious choice of metal to use when producing commemorative coins. In the past, special sets of coins were issued to mark coronations and other important state events, and these often included sets of gold coins. Much of the gold reserves held by many central banks used to be held in the form of gold coins. Because gold coins are generally no longer used for circulation, this appears to have declined in recent years. Most of the pages on our site list gold coins for sale. Please see our International Gold Coins page. We are always happy to buy any gold coins in any quantity. Please see our gold buyers page. Most gold coins can be bought and sold at prices closely related to their intrinsic gold content. The most popular bullion coins are krugerrands and sovereigns. Some gold coins are rare. We are always happy to buy or sell any gold coins, common or rare. 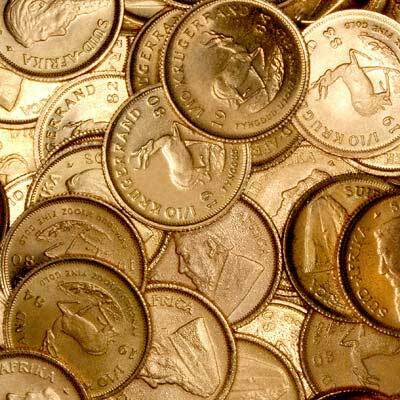 Gold coins make an excellent choice for collectors. Many gold coins can be bought in excellent or even mint condition for only a relatively small premium over their gold content. Because they are gold, they are unlikely to tarnish or discolour.